Coaching is a process that enables individuals to achieve their full potential. People come to be coached because they want to be happy, or happier. They want a satisfying life filled with good experiences. They want good relationships, a job they enjoy and are proud of, where they can use their talents and make money. They want to see their good dreams come true. Business coaching plays for equally high stakes, maybe the very survival of the business. For a business to thrive and be successful, people need to be happy in their work and good at what they do. Happiness is not a prescription you can go and have filled by a happiness chemist. It’s not something you possess, but something you are. Many people think of pursuing happiness, when they have the next possession feeling or person, then they will be happy. This is a mirage. If you are pursuing happiness, you have put it outside of yourself and possibly out of reach. You can not pursue something you have. You can only be happy right now. And the only person’s happiness you can deal with is your own. How happy are you? Coaching is about self awareness- finding out where you are and looking for ways to move forward. 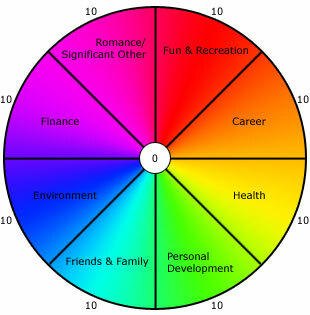 Take a moment to look at the chart below and HONESTLY (no one will see it) score each section out of 10 in terms of how happy you are with those areas of your life today. Once completed you will be able to see which area of your life needs attention and how by possibly changing one small thing in that area could raise your overall happiness by feeling more balanced. If you’re life is out of balance and you are not sure about how to make the changes to improve it then you probably need a coach! One thing for sure is that if you don’t change anything you will just stand still. You have just one life and you are the person who controls it so why not make the most of it!